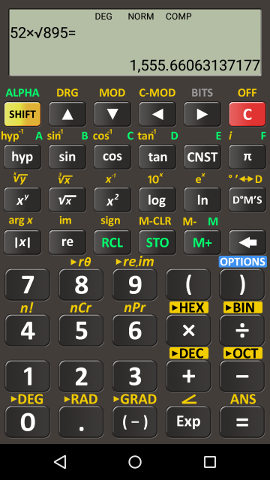 Scientific Calculator (previously known as PowerCalc) is an excellent scientific calculator app for Android. It retains the simplicity and familiarity of RealCalc‘s UI while having lots more calculation buttons. The equation editor can handle brackets nicely, the display is multi-line showing both the equation and its result and there is even history. If you use a scientific calculator every day, then I recommend this over the simpler RealCalc. Joan Ferrer: When you type -1, use the minus button that is below the 3 button. It works! Why does the link to Scientific Calculator show a free one, but when I try to access it on Google Play on my Android device to actually install it, only Scientific Calculator Pro shows up with a price tag? Is the free version no longer available?